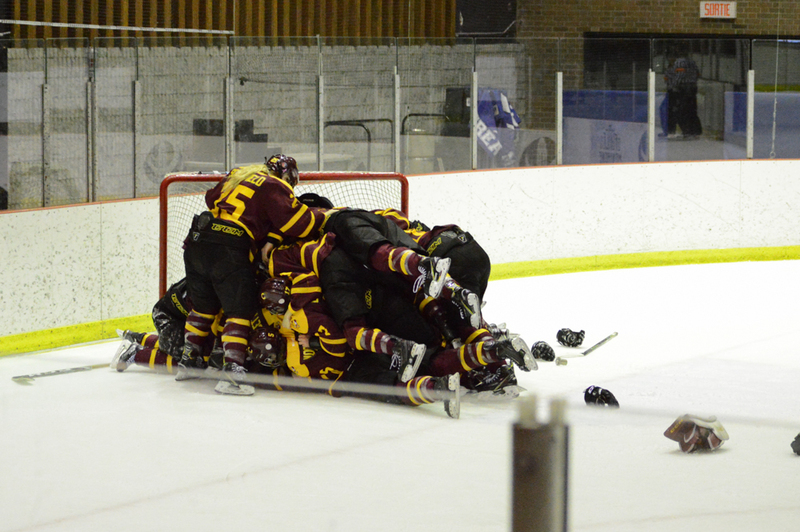 In their third and final match-up against the Université de Montréal Carabins on Sunday, the Concordia Stingers women’s hockey team dominated huge chunks of the second and third periods to claim the Réseau du sport étudiant du Québec (RSEQ) championship. Sophie Gagnon, Marie-Pascale Bernier and Claudia Dubois all scored for the Stingers in game three, as the team managed to once again hold off a late surge from the Carabins. Head coach Julie Chu has won medals at Olympics, World Championships and the 4 Nations Tournament as a member of the United States national team. Now, she’ll add RSEQ champion to the list. This is her first banner as coach for the Stingers, and for her, this title is huge. “This was about our team coming together as a family and executing in the end and doing a great job. That’s what happened today, and that’s what I’m proud of,” Chu said after the game. The Stingers will return to nationals after finishing fourth last year. Photo by Mackenzie Lad. The Concordia Stingers women’s hockey team forced game three on Saturday after beating the Carabins 3-2 in game two. Game three was scoreless after the first period of play. The Stingers and Carabins generated quality chances, but goalies Katherine Purchase of Concordia and Marie-Pier Chabot of the Carabins turned away every opportunity. The Stingers’s first goal of the game came from Sophie Gagnon, who had been playing with high energy throughout the series and was rewarded when she planted herself in front of Chabot on the power play. Stingers forward Stéphanie Lalancette set up in her usual power-play position, just inside the face-off circle, and tee’d off a slap shot. Chabot made the initial save, but Gagnon managed to bang home the rebound. In game one of the series, the Stingers were unable to generate those types of quality chances and let the Carabins dictate the pace of the game. In games two and three, the team used their speed to control the puck up high in the offensive zone. That’s where the Stingers were able to begin their attacks, and it’s part of the reason they won the title. “What [the team] does every single day to work and be committed to the process, that’s why we’re successful right now,” Chu said. The Carabins came into this game as the superior physical team, and had previously used their size to outmuscle the Stingers. Late in the second period, the Carabins responded with a goal of their own. A rebound from Purchase turned into a scramble, and the Stingers goalie was unable to track the puck before Marie-Pier Dubé jammed it into the net. The game remained tied going into the third period. Coming out of the gate hot was a big talking point for the coaches and players after the two previous games. Only 53 seconds into the third period, the Stingers delivered. Audrey Belzile forced a turnover in the neutral zone for a two-on-one break with linemate Marie-Pascale Bernier. Belzile slid the puck over to Bernier, who appeared to fan on the shot, but got enough on it to slide it past a sprawling Chabot. Two minutes later, it was Claudia Dubois who added the third goal for the Stingers. Dubois forechecked the Carabins defenders hard, won the puck from the corner and brought it behind the net. She made a quick turn for the wraparound, and just waited for Chabot to open her pads up before firing the puck five-hole. After that, the Carabins brought the attack. They pulled Chabot with two minutes left in the game. Belzile took a penalty at the same time to give the Carabins a six-on-four player advantage. The Stingers penalty kill went to work, throwing themselves in front on everything. Time wound down, and the Stingers cleared the bench to celebrate their first RSEQ title since 2005. Friends and family of the team joined them on the ice as Concordia Athletics Director D’Arcy Ryan presented them with their medals. Standouts from the game include Purchase, Chabot and Stingers forward Keriann Schofield, who turned in an impressive performance of drawing penalties and being a general disturbance for the Carabins. The Stingers will now get set for the National Championships, to be hosted by Western University in two weeks. According to Chu, the team will get Monday off, but they will be back on the ice on Tuesday to prepare.